Contemporary Controls prides ourselves not only on the quality of our products but also in our commitment to teach those interested in industrial and building automation. One of the latest examples of this commitment can be seen at Walla Walla Community College were a BAScontrol20 BACnet/IP Sedona controller was instrumental in constructing a SCADA simulator for students. Jon Vietti, a DDC Controls Consultant/Specialist at DDCSupportServices.com, was recently hired by Walla Walla Community College to create a SCADA simulator that provides remote monitoring and control of the college's Amatrol Process Control System trainer. 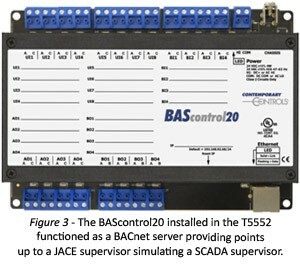 A BAScontrol20 BACnet/IP Sedona controller was critical to the task. Providing students with the capability to earn an Associate's Degree in Plant Operations, the Walla Walla Community College has an extensive program which teaches students the necessary skills to excel in their chosen career path. The college offers a variety of degrees within the program including a Certificate in Bioenergy Operations, an Associate in Applied Arts and Sciences degree in Plant Operations and a Certificate in Biomass Feedstock Management among others. 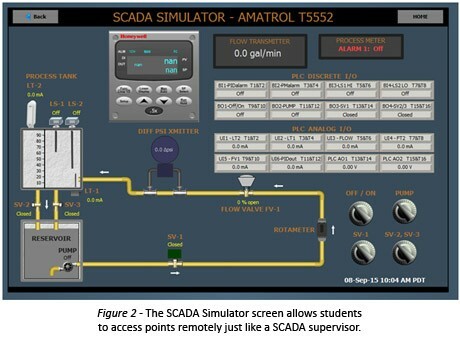 To create the SCADA simulator, Vietti used a Contemporary Controls' BAScontrol20 to integrate an Amatrol T5552 Level and Flow Process Control Learning System with a JACE located in one of his PT-121 portable training units. Amatrol, for those unfamiliar, designs and manufactures technical learning systems, hands on simulators, and more to train and familiarize workers with the latest technologies. The T5552 has a liquid process tank with level limit switches, level sensors and drain solenoid valves. The system works by pumping liquid from a storage tank (while throttling the amount) into a process tank via an analog valve under the control of a PID loop controller. 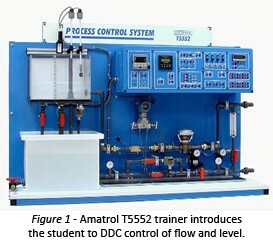 The Amatrol trainer allows students to learn the basics of flow and level control by configuring the trainer for on/off or proportional control through the use of jumper plugs. In order to introduce the student to the concept of SCADA (Supervisory Control and Data Acquisition) that would allow the student to control the trainer remotely, a JACE (Java Application Control Engine) was tapped from an existing PT-121 DDC trainer made by DDC Support Services. Vietti decided to install a Contemporary Controls' BAScontrol20 unitary controller and Ethernet switch into the T5552 trainer that would allow for the monitoring and control of several points within the trainer via BACnet/IP to the JACE over Ethernet. The BAScontrol20 provides 20 points of physical IO along with 24 virtual points - all accessible by a BACnet/IP client. Using the BAScontrol20, Vietti was able to leverage both the real and virtual points to be what he calls a "smart BACnet IO module." In addition, the Honeywell PID controller in the trainer is accessible via Modbus TCP meaning that the JACE could completely take over the control of the trainer over Ethernet. A custom screen (Figure 2) was created that would allow the student to monitor or manipulate all the points in the system, including PID tuning parameters, to learn their impact. According to Vietti, :the BASControl20 not only allowed me to access the analog and binary I/O in the trainer but some scaling of data was needed which I accomplished using the BAScontrol20's resident Sedona Virtual Machine (SVM). I could program the Sedona logic and make the custom screen with the same Niagara Workbench tool using a simple Ethernet connection." The BAScontrol20 is a freely-programmable controller executing Sedona's drag-and-drop methodology of assembling components onto a wire sheet to create applications. It can be programmed using Niagara Workbench or a third-party Sedona programming tool; or configured for BACnet/IP remote I/O applications using a common web browser. Through the custom setup that Vietti designed, students are able to further their knowledge of plant operations and become better prepared for the tasks and problems that face them in the real world.